“The Sin Blue Line: How God delivered me from the LAPD and other miracles” from Christian Faith Publishing author Barry Q. Brooks J.D. tells his struggle to overcome systematic corruption in the LAPD. Only through the helping hand of God was he able to endure retaliation by those who had sworn to uphold the Law. “The Sin Blue Line: How God delivered me from the LAPD and other miracles” is the creation of published author, Barry Q. Brooks, J.D. Barry Brooks grew up in the quiet suburbia of North Reading, Massachusetts before moving to Los Angeles in 1988. In addition to his twenty-five years with the Los Angeles Police Department, he has been a member of the Army Military Police, the Essex County Sherriff's Department, and the US Marshals. Barry has also worked for the Department of Defense as well as the Office of Chief Trial Counsel, Enforcement Section, California Supreme Court. He interned with the Los Angeles District Attorney's Office and the Los Angeles City Council as well. Barry has been a graduate professor of law, criminal justice, and homeland security for over twenty years at several local Southern California Universities while has appeared as a panelist on the Appologetics.com Christian radio program on KKLA. He currently owns and operates his own private investigation firm and is an active volunteer at Calvary Chapel in Costa Mesa, CA. Barry holds the following degrees: Juris Doctor Law, Master of Science Criminal Justice, Master of Arts Organizational Management, Masters of Arts Faith and Culture, Master of Science Communications, Bachelor of Science Criminal Justice and Associates of Science Criminal Justice. He and his wife, Nevine, have been married for over twenty-three years. They have four children, Rachel, Mark, Sarah, and Elizabeth. --Barry Q. Brooks J.D. Published by Christian Faith Publishing, Barry Q. Brooks J.D.’s new book shares the author’s personal experience with the Lord as he struggled to overcome systematic corruption and retaliation in the LAPD. At the age of twenty-three, Barry Brooks was saved after accepting Jesus Christ as his Lord and Savior. Shortly thereafter, the Lord called Barry from a quiet, small town in New England to South Central Los Angeles where he joined the LAPD. Facing deadly threats on a daily basis in the streets of Los Angeles during the crack wars of the late 1980s and 1990s, his biggest battle would not come from the dangers of the street. It would come from within the ranks of the LAPD. After exposing systematic corruption, which could be traced all the way up to the Chief of Police and city officials, Barry would endure a seventeen-year battle of retaliation, which came very close to costing him his life, his liberty, and his career. God, however intervened in overt and incredible ways during this time of trials, thereby giving Barry the strength to endure as his faith grew. Although Barry's story reveals the sins of the LAPD's thin blue line, the main purpose of this book is to glorify God and all He did for the author in his time of need. View a synopsis of “The Sin Blue Line: How God delivered me from the LAPD and other miracles” on YouTube. Consumers can purchase “The Sin Blue Line: How God delivered me from the LAPD and other miracles” at traditional brick & mortar bookstores, or online at Amazon.com, Apple iTunes store, Kobo or Barnes and Noble. 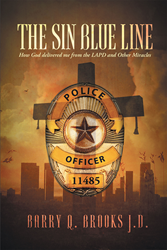 For additional information or inquiries about “The Sin Blue Line: How God delivered me from the LAPD and other miracles,” contact the Christian Faith Publishing media department at 866-554-0919.